This is what the environment ministry wants in the draft Wetlands (Conservation and Management) Rules, 2016. The draft rules, which replace the existing Wetland (Conservation and Management) Rules, 2010, are up for public comments till 31 May, after which they may be brought into force. As the excerpt from the drafts illustrate, the new rules will make wetland conservation a joke. A wetland is a water body such as a lake, marsh, pond, mudflat and the area around from where it gets its water. Wetlands are a paradise for fish and fowl, help store and recharge groundwater, and act as buffers against storm and flood. Everyone from farmers to city dwellers to birdwatchers need wetlands. 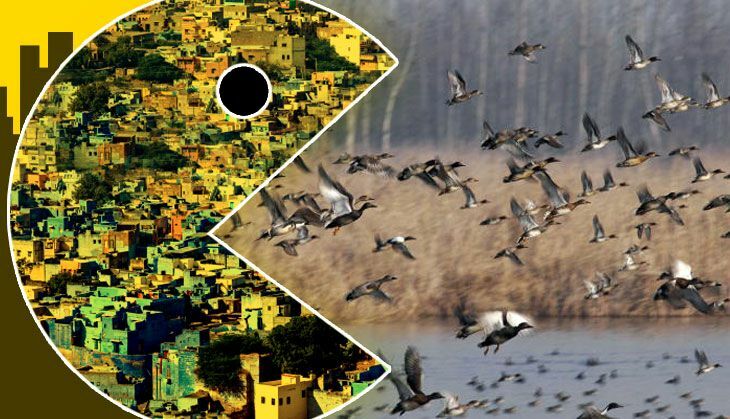 While wetlands nationwide are threatened by encroachment and development, the Narendra Modi government's draft rules show no indications of acknowledging this threat. When Chennai flooded, encroachment of wetlands (marshes, ponds) -- with office buildings and houses -- were a reason why rainwater submerged the city. While wetlands such as Mumbai's Sewri are breeding grounds for the magnificent flamingoes. The draft rules, environmentalists say, reinforces the stereotype that governments see wetlands as wastelands. The essence of the new rules is to decentralise wetlands management to states. The Centre will have a say only in 'exceptional cases' While the 2010 rules gave some role to states, the draft rules gives them all powers. But in the process, the whole conservation process has been weakened. 2010 rule: The Centre created the Central Wetland Regulatory Authority (CWRA) headed by the secretary, environment ministry, and consisting of bureaucrats and experts. Draft rule: Removed this entirely and forms State Level Wetland Authorities in each state. Also read- Blight on the land: why are Kerala's paddy fields vanishing? Power to issue "whatever directions, necessary for conservation, preservation and wise use of wetlands." The language has been mellowed down to "necessary directions for "conservation and sustainable management of wetlands". While the Central government had some powers over ensuring the state governments identified wetlands, the new rules do not outline any such checks, since the entire process is now within the ambit of the state government. 2010 rule: States to identify wetlands within their territories, submit details to the CWRA, based on which the central government notified the wetlands. Draft rule: Complete discretion to the chief minister, as both head of government and head of the wetland authority. "Wise use" -- decided by the user 2010 rule: Six activities prohibited in wetlands, including reclamation, constructing permanent structures within 50 metres, setting up or expanding industries, throwing waste, etc. Draft rule: Deletes entire list except reclamation. Allows activities that make "wise use" of wetlands, and empowers the state authority to decide what does and doesn't amount to "wise use". 2010 rule: 12 activities including fishing, boating, dredging, etc restricted without prior permission from the state government. 2010 rule: stated that the rules apply to "areas rich in genetic diversity," "areas of outstanding natural beauty", besides protected areas. 2010 rule: Wetlands had to be notified within 1 year of the rules coming into force; there were deadlines for each process along the way. Draft rule: does not mention any timeline. 2010 rule: Environment impact assessment was compulsory before undertaking any activity on a wetland area. 2010 rule: includes "wetland complexes", which are a set of wetlands dependent on each other. 2010 rule: Explicitly includes all wetlands and wetland complexes larger than a specified area (5 hectares for high-altitude regions, 500 hectares elsewhere). Draft rule: Only those wetlands notified by state government; no size specified. 2010 rule: central authority's decisions can be appealed before the National Green Tribunal. Several organisations, including Bombay Natural History Society, WWF India, Legal Initiative for Forests and Environment, International Rivers, INTACH, Yamuna Jiye Abhiyan and South Asian Network on Dams Rivers and People have sent, or are in the process of sending, representations to the environment ministry. Among the concerns is that the 2010 rules itself were barely getting implemented. No state has identified a wetland yet, and few have made state-level nodal agencies mandated by the 2010 rules. "There is evidence that for 6 years state did not perform its duty of identifying wetlands and sending the details to the centre. Now the centre wants to give full responsibility of conserving wetlands to the states. How can that happen?" asked Ritwick Dutta, environment lawyer. Dutta is appearing in a case before the National Green Tribunal challenging the tardy implementation of the 2010 rules. On 22 April, weeks after the draft rules were published, the Tribunal asked a status report from the centre on declaration of wetlands, and the states to submit the list of wetlands in their territory. "There is no timeline for action and nothing is mandatory. Mechanism to push and prod states to complete the process in a time-bound manner is required," said Pushp Jain, director of EIA Resource and Response Centre. "There are a lot of local pressures confronting protection of water bodies. It becomes difficult for state governments to have the political mandate to act. That's where you need the central authority," said Neha Sinha, a wildlife conservationist. Sinha added that it is worrying that the new rules exclude references to areas of genetic diversity. "There are not enough safeguards for biodiversity. The draft rule seem to open wetlands for commercial use," she said.